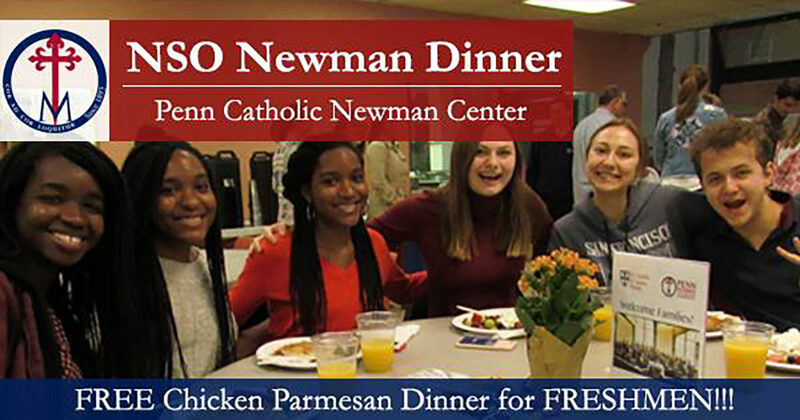 Enjoy an all-you-can-eat Chicken Parmesan Dinner while dining with the Penn Catholic Community! The staff members and student board will introduce themselves to the community, and after the dinner, we will have a fun board game night. If you have a board game that you would like to play with the community, please bring it with you! Dinner is FREE for freshmen at all Newman Dinners throughout the year (please bring your Penn ID for identification). Dinner is $5 (cash or Venmo) for everyone else. *Dinner includes chicken parmesan, pasta, salad, dessert, and more! We do not want cost or any allergies to be a barrier to attending our Newman Dinners. Please contact us at pennleader@saintsaj.org if you have any questions or concerns.